Kilts should ‘cut the knee’ (kneeling on the floor, the front of your kilt should just touch it and no more) and it should hang level ie should not droop at the back (wear braces if necessary). The top of the sporran cantle should sit a hands width (approximately 4 inches) below your waistbelt, or where your waistbelt would be. If you are wearing a waistcoat you should NOT wear a waistbelt. 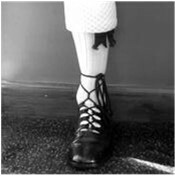 The turnover of your kilt hose should be 3 or 4 fingers (approximately 3 inches) and the top of this should be 3 fingers (approximately 2 inches) from the bottom of your kneecap ie there should be a gap of approximately 3 inches between the bottom of the kilt and top of your kilt hose. Flashes (showing approximately 2/3 inches only) should be worn to the side. Your sgian dubh should be worn in your right stocking showing only approximately 1 inch. Gillie brogues should be laced with 5 turns at the front to form a stem, crossed at the back and then tied at the side. They should not be ‘criss-crossed’ up the leg like a Roman Centurian!! You should be able to draw an (imaginary!) 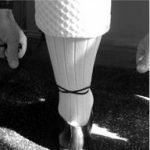 line from your nose, through your waistcoat buttons or waistbelt buckle, down through the centre line of your kilt to the centre of your sporran cantle. Hopefully this is of some help. If you have any questions, or perhaps you disagree with something, please get in touch.